Totana.net - Cebag 'Multiple irregularities containing PGMO Totana and make it unfeasible agreements approved by the region. " Cebag 'Multiple irregularities containing PGMO Totana and make it unfeasible agreements approved by the region. " Executives Cebag associations and Coag have crowded this morning the hall of the city of Totana than 8.30.
had convened a special meeting to discuss the monograph General Municipal Development Plan (PGMO) Township. PB has approved this morning alone modification and rectification of PGMO Totana and planning agreements, with votes against PSOE and IU. "Hipotecad your farms and not ours." 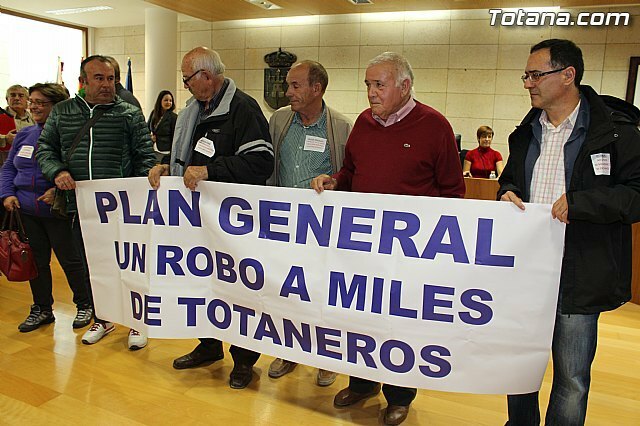 At the end of the plenary, have deployed a banner in the same Hall of Sessions, with text: "General Plan: stealing thousands of totaneros". After completing the act, the President of Cebag, José Luis Hernández, present at the meeting, said that "We will not tolerate that 10,000 hectares of rural estates of thousands of totaneros are protected and which prevents or hinders the possible execution of a agricultural facility or a house, while just off the property - and even in the irrigated perimeter of Decanting is authorized to carry out a development with hundreds of homes, reducing the cost of agricultural land and irrigation water supply to the Transfer ". José Luis Hernández announced that "integrated and mainly Cebag The Farmers Union (COAG), organizations will be held in the coming weeks, meeting with various sectors and areas affected, with plans to present - as they did in 2008 thousands allegations, the public information process a month you will start the next few weeks. " Even "no-rule under President Cebag- perform some action through the courts." The president of Cebag "we have tried to make a gross-up with this plan, to justify the approval of some conventions that have caused, two mayors are passed through the jail and a mayor is charged. And we have tried to use as a bargaining chip to achieve that goal, thousands of private owners, which is mortgage and expropriates the use of their farms, to promote the viability and approval of these agreements seek to build 20 25,000 new homes. "